Cauliflower Cheese is an all-time favorite dish. Not only is it a great way to eat cauliflower, but it also doubles up as both a side dish and the main course - perfect for vegetarians. Cauliflower Cheese is also one of the main components of the British National Dish, Roast Beef, and Yorkshire Pudding. 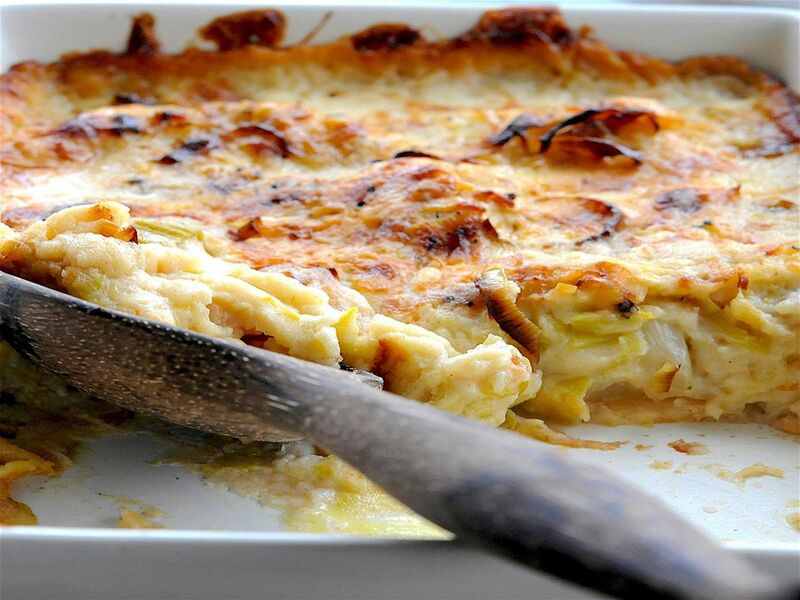 Not that Cauliflower Cheese isn't perfect as it is, sometimes it is good to ring the changes and in this recipe, the addition of some cooked leeks adds an extra flavor and of course, is better for you with an additional vegetable in there. Heat the oven to 395 F.
Remove the green outer leaves from the cauliflower and the thick white stalk taking care not to break off the florets. Cut a deep cross in the bottom of the stem then steam whole over a pan of boiling water until slightly tender but not cooked. The cauliflower florets should still be firm. Remove the cauliflower from the heat and leave to cool. Place the butter into a large saucepan and melt over medium heat. Lower the heat then add the finely chopped leeks and cook until the leeks are softening slightly but not cooked thoroughly. Remove 1 tablespoon of the leeks and keep to one side. Add the flour to the remaining leeks in the pan and stir thoroughly, the flour will go lumpy but do not worry stir for 2 to 3 mins; this is to cook out the floury taste and to soften the starch grains in the flour ready to make the sauce. Add the salt and mustard powder (if using) and stir again. Turn the heat up to medium and add the milk in one go and stir briskly until all a smooth sauce is formed. Continue stirring until the sauce is thick and glossy (about 5 minutes) If the sauce is very thick, add a little more milk, the sauce should be thick but still a little on the runny side. Finally, add the grated cheese and stir until melted. Remove from the heat. Break the cauliflower florets away from the thick, central stalk taking care not to break it into tiny pieces. Place these florets in a greased baking dish large enough to hold all the florets in just one layer. Pour the thickened cheese and leek sauce over the cauliflower ensuring all the florets are covered. Finally, sprinkle the extra grated cheese, scatter the tablespoon of softened leeks and end with a good twist of black pepper. Bake in the preheated oven until the sauce is bubbling and golden brown on the top, approx 20 minutes. Test the cauliflower is cooked through by piercing with a sharp pointed knife, cook a little longer if necessary. Serve the cauliflower cheese and leeks as a side dish with a roast, and it makes a lovely main dish served with a baked potato and a crispy salad.